American Kitchen Concepts, Inc. has been in business for 22 years and guarantee customer satisfaction. Simply put our client satisfaction and our high level of service is second to none. 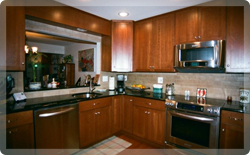 American Kitchen Concepts Inc. is a full-service kitchen remodeling company that serves the Howard County area. Our reputation as the leading kitchen remodeling contractor in the greater Baltimore area is based on our superior customer service, attention to detail, superior quality, and unbeatable value. We offer semi-custom cabinets, granite and Silestone counters. We also offer flooring options from laminate to ceramic, and hardwoods to luxury vinyl. As we transform each kitchen into a masterpiece, it’s done with the utmost honesty and integrity. So when you’re looking to do some kitchen remodeling, make the smart choice and contact American Kitchen Concepts, Inc.
We also own and operate a fully stocked showroom in Columbia MD, which has played an important role in our thriving business since 1993. American Kitchen Concepts is rooted in the community with a showroom conveniently located in the center of Howard County located between Columbia and Ellicott City. Our showroom allows our clients to save time from running all over town for various materials and gives a space to visualize the kitchen coming together. We select the cabinets, counters, floor, backsplash, sink and faucet all from our showroom saving clients time and money! The team at American Kitchen Concepts, Inc. is proud to say that our dedication to superior service has allowed us to be awarded the Angie’s List Super Service Award every year since being listed on Angie's List in 2009.